I didn’t make it “home” to see my mom and big sister this weekend like originally planned, but I keep telling myself it’s okay because we’re all going on a little weekend getaway next weekend! Super excited. Today turned out to be pretty spectacular. It’s not even 5 pm as I write this, but I’m still pretty comfortable saying that. This morning, The Fiance went to town for some fencing for our vegetable garden (so that it remains, you know, a vegetable garden as opposed to a massive play area for the dogs – they. love. to. dig.) and came home with surprises! For me! For Mother’s Day! 🙂 I may or may not have been hinting for a couple weeks about it, but regardless – he went above and beyond what I expected! So. pretty! We’ll probably be adding to the collection, and getting some that have white on the inside, instead of the purple. Oh, I just love them! He also brought home two cards for me – one “from” the baby, and one, of course, from him. The one from the baby is too cute! I hope you all had a great Mother’s Day – whether it was spent with your mom, your significant other’s mom, with your own babies or puppies or kitties or other monsters, or even if it was just a fantastic Sunday, regardless of the holiday. Happy MOTHER’S day 🙂 Congratulations again!!! 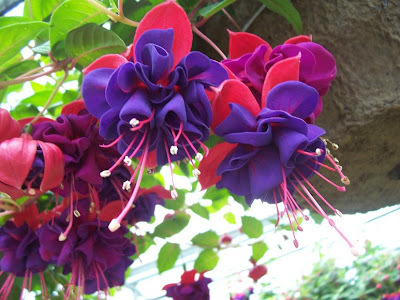 I love fuchsias, they’re so pretty. I got stuck working at the garden center part of my retail job one summer in high school/college even though I knew nothing about plants…. those were always one of my favorites. Also: that from-baby card is just too cute. They are SO. PRETTY! I’m in love with them, I can’t believe I never knew about them before! Ah! Hehe,jeg sÃ¥ en annen jente som hadde fobi mot bomull.Ikke vet jeg hvordan det er mulig men hun var ihvertfall livredd bomull. I was thinking the other day I needed a salad spinner. Then I remembered it’s just easier to buy greens prewashed in the bag. Laziness FTW!Now I want pop rocks and Dr Pepper. Please make supplemental results available in Google Web Master Tools. They are very useful in debugging multiple URLs to the same content, linking issues and other SEO issues that are not as easy to understand without the distinction.